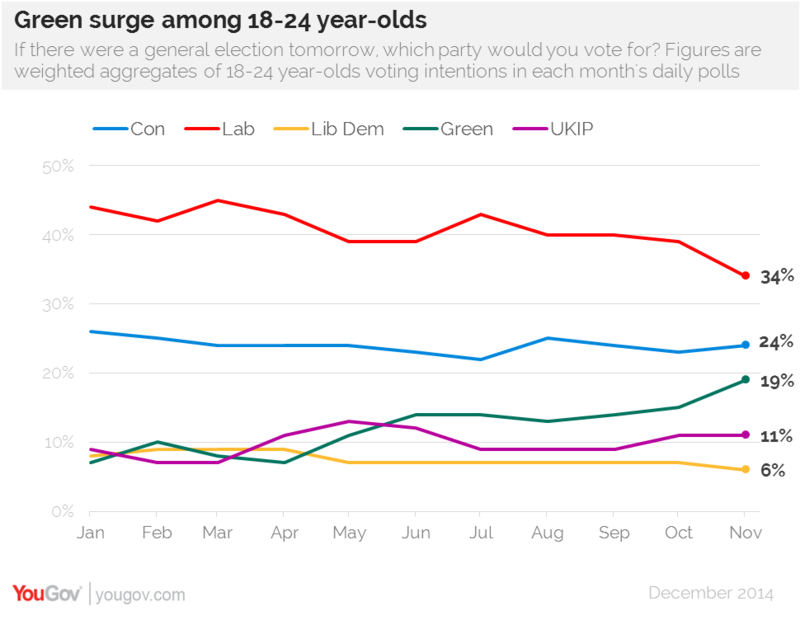 What a week for the Greens: first they sail past both UKIP and the Liberal Democrats on membership numbers; then they secure a place in the televised leaders’ debates during the election campaign. I suspect I’m not the only Labour member who feels a bit conflicted by all this. On one hand, it’s pretty clear that the ‘Green surge’ spells nothing good for progressive politics in electoral arithmetic terms. It’s no wonder Labour created a special unit headed by Sadiq Khan to counter the Green threat a few months back: it’s all starting to feel uncomfortably reminiscent of the US election in 2000, when Ralph Nader drew votes away from the Democrats and allowed George W Bush into office for the first time. The difficulty is that many young voters are immune to conventional blandishments. While the aspirationalists among them may put their own best interests first, idealists of all ages want something more … Many voters are now listing towards the Greens because they feel that Labour is still not sufficiently valiant in the defence of human rights and civil liberties, still too effete a crusader on climate change and still draped in the tattered mantle of failed politics. I think she’s right on all those counts, and would add a few others too: actually doing something about the fact that the top 1% now own more than the rest of us put together, facing up to the fact that all the war on drugs has achieved is to criminalise huge numbers of young people while adding narco-barons to the threats facing fragile states, or getting serious about regulating the financial sector to prevent a repeat of 2008 to name just three. To be sure, I don’t think the Greens’ ‘mini-manifesto‘ adds up to a serious programme on all these issues, any more than Russell Brand’s book does; and as they start to get more airtime, some of the lacunae in their policy platform will come more to the fore, just as has happened with UKIP. And to meet that hunger, it’s not enough for Labour to make some tweaks to its comms strategy (Sadiq Khan’s new unit is apparently focusing on “a toolkit of local campaign materials for constituencies to use and … a national media strategy to combat the Greens”). Instead, as Peter Hain observed last week, Labour needs to think about actual policy. So imagine a dream scenario in which Ed Miliband – or, for that matter, Nick Clegg or David Cameron – decided that there were votes in being visionary; in a politics of a larger us, a longer future, and a different good life. What are the policies we might wish for in their manifestos? I’ll set out a few starters for ten in a couple of days’ time.